When you think about hiring an interior designer you might zero in on aesthetics: wall colors, window treatments, pillow patterns. But that’s just scratching the surface of what we do at Accents of the South. This post is to describe the process of how we work and why you might need to hire us! You may have a vision for your home, but we can help you clarify it and bring it to life. Our training and creative mind-set allow for devising solutions that you might never have imagined. With attention to the tiniest details we can transform your space into a haven that looks polished and pulled together. From floor plans and architectural details to the last nail-head, tassel and tuft, we go beyond cosmetic concerns to ensure that your space feels harmonious through and through. We believe the development of each home is an evolutionary process honed by careful, analytical planning to the realization of a cohesive whole. No matter your project type we start the design process the same. In the initial design meeting we listen to your ideas and thoughts and take notes and gather information. From here we develop a design through research and planning. These preliminary designs are presented and reviewed with you then we discuss the next step and the process continues. 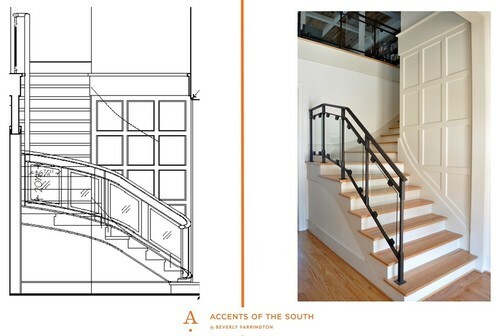 If your project is furnishings and a refresh, we at Accents of the South understand how the subtle interaction between space, light and material tie together for a complete effect, curating a custom design as unique as you. We understand the importance of comfortable, well-made furniture and offer hundreds of brands to suite any budget and needs. After the initial design phase, we take our designs from budgeting and ordering to receiving and installation. You can read more about what to expect when you buy furniture from us here. If your project is a renovation or new construction, our involvement in this process can begin as early as you start dreaming! Floor plans, elevations, moldings and trim details, cabinet drawings, tile layouts, plumbing, lighting design and selections. We take care of it all! On larger scale projects, Accents of the South, works in collaboration with you, the architect, and artisans. Involving us in the initial design phase will insure everyone will be on the same page. We can iron out any potential discrepancies that would be the “bones” of the home – such as doorways, ceiling beams or interior columns. It’s one thing to move a wall on paper; it’s another thing entirely to move it after installation. We love getting pins sent to us from clients and invitations to idea-boards on Houzz. It helps us dive deeper into what you want and gives us the direction the project needs to take. It is our job to take your visions, ideas, Pinterest boards and Houzz accounts and make them all come together in a cohesive, beautiful way. Taking those ideas to the next level is where we fly! Our architectural drawings are the key to a successful build-out. Stay tuned for more on architectural drawing services! So if you have thought about hiring an interior designer, now is the time to give us a call. We take on projects big and small. So no matter your needs, we are here for every aspect! We would love to hear about your project today!